So, look at my two little cutie pies. For some reason? 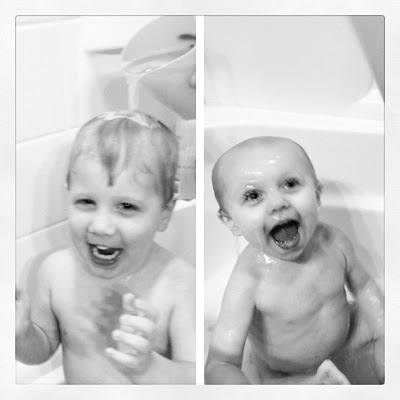 They enjoy having water poured over their head in the tub. Yes, both of them. What kind of weirdo kids enjoy that? BAHAHA! G used to HATE us rinsing her hair, but now she loves it too...guess its something they grown into? Have a great weekend! Such big happy smiles! Love it! yep, Ashlyn who is 1 week younger than Brynn HATES it! To make it worse she leans over the tub so it pours AAALLLL over the floor! Every.single.time. Enjoy your VERY happy babies! And keep blogging! What would we do without our weekly pics of those precious babies?